The last twenty years has seen huge progress in our understanding of the injured psyche. Inner space is opening to us in a way that is helping us heal the deep psychological wounds that many of us carry. 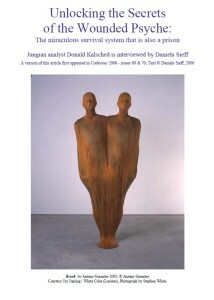 Donald Kalsched has been exploring the archetypal dimensions of the trauma process. His interest arose out of his work as a Jungian analyst: many of his clients got stuck in their therapeutic journey, or worse, they tried to sabotage it – Kalsched wanted to understand why. He discovered a common thread amongst these clients in that most had suffered childhood trauma and so he started to ask: ‘What is it about trauma that leads people to sabotage the road to healing? What are the systems that come into play in order to help a child to survive psychological trauma, and how do these systems limit later development?’ His ground-breaking conclusion was that the psyche’s internal response to trauma sets up defences that cause immense pain, but that this very defence system is also a survival system, designed to save the person’s life. This profound discovery has had a huge impact because it changes our understanding of what happens in psychological trauma, and so opens the door to healing. Daniela Sieff: Your work focuses on the psychological defence system that gets set up when a child undergoes some kind of unbearable trauma. What is the essence of the system? Donald Kalsched: If a child’s social and emotional environment is good enough then the child will develop as an integrated whole. The child’s creativity, confidence and sense of self will unfold organically, and as the child grows up s/he will learn how to protect his emotional self in a healthy way. However, when a child is abused, when his or her genuine needs are consistently unmet, or when the child is shamed, this healthy developmental process is compromised. A psychological survival system kicks in and the problem is that because the child is so young this survival system has only a very limited number of options available to it. After all, a normal reaction to unbearable pain is to withdraw from scene of injury. Because the child is highly dependent and can’t leave, a part of the self withdraws instead, and for this to happen the psyche splits. One part regresses back to a time of relative innocence, before the trauma and one part “progresses”, i.e., grows up very fast. The essence of the child – the creative, relational, authentic spark of life which is at the very core – goes into hiding, deep in the unconscious. At the same time, another part of the child’s psyche –what Winnicott called the “false self”— grows up prematurely and becomes a rigid adaptive self, complying with outer requirements as best it can, while protecting the lost core of the self by hiding it. The initial moment of psychological dissociation is a miraculous moment in that this defensive splitting saves the child’s psychological essence in an encapsulated state, but it is also a tragic moment because with this splitting the child steps out of the reality and vivacity of his or her life. It is a moment when the child separates from experience, goes into trance, and when the child’s capacity for genuine and trusting human relationships starts to disintegrate.